The Center for Evidence-based Policy (Center) at Oregon Health & Science University is a national leader in evidence-based decision making and policy design. While the importance of public involvement in research is gaining recognition in the US, there are still relatively few avenues for researchers and members of the public to engage in meaningful work together. Many Center projects are focused on bridging the cultural divide between the public, policymakers and researchers in the US. A recent example is the Expert Interviews Project (EIP) for the newly established Patient Centered Outcomes Research Institute (PCORI). The EIP identified best practices in public involvement through in-depth qualitative interviews with nearly 90 national and international experts and a dozen discussion groups with members of the general public across the US. While many of the findings are simple common sense for those who are experienced in patient engagement, we heard many examples in which basic principles of engagement had not been employed to the detriment of the research and patients. dedicated resources to conduct engagement activities. These themes, along with findings from other work we have done, informed the development of a framework for effective public engagement (Figure 1). The framework focuses on four over-arching systemic components necessary for effective engagement, and five steps to ensure all elements are present. 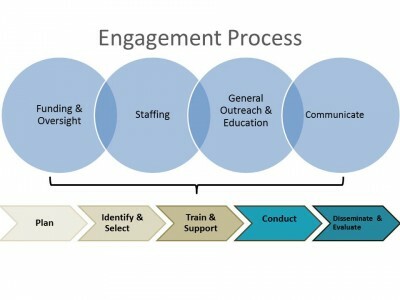 Planning for engagement involves determining project goals and rationale for engagement; understanding patient and community needs; determining points of engagement; creating transparency; and identifying logistical requirements. Identifying and selecting participants involves identifying relevant stakeholders; recruiting and selecting stakeholders; and matching stakeholders with points of engagement identified in planning. Training and supporting participants includes providing orientation; training and building participant and researcher capacity for involvement; providing support to participants; and mentoring stakeholders. Conducting the project may involve various forms of public or patient engagement from focus groups and surveys to committees, boards and as co-producers of research. Evaluation and dissemination includes the distribution of findings; evaluation of both the processes for public engagement and the results of the research; creating participant feedback loops; and using findings to inform future public or patient engagement. Plans are underway to continue development of the EIP into a toolkit for use by researchers and the public. We hope that the combined ‘pull-push’ of funding and education will help to increase the involvement of US patients in the research that so importantly influences their lives and health. We welcome enquiries regarding our work and potential collaborations.